Tedeschi, R. G., Shakespeare-Finch, J., Taku, K., & Calhoun, L. G. (2018). Posttraumatic growth: Theory, Research, and Applications. NY, London: Routledge. Dominick, W., Mulhem, E., & Taku, K. (In Press). Posttraumatic growth and resiliency associated with medical mishaps in residents. In M. Shabahang, M. Hunsinger, & B. Lang (Eds. ), Creating a culture of resiliency and wellness among physician residents. Cognella Publishing. Taku, K. (2016). PTG no kanosei to kadai [Potential and challenges of PTG (written in Japanese: 宅香菜子(2016)．PTGの可能性と課題.金子書房）]. Kaneko Shobo, Tokyo, Japan. Oshio, A., & Taku, K. (2015). Shinrigaku no sotsugyo kenkyu workbook: Hassou kara ronbun kansei madeno 10 stage [Workbook for senior research project in psychology: 10 stages from getting ideas to completing the thesis paper (written in Japanese: 小塩真司・宅香菜子（2015）．心理学の卒業研究ワークブック：発想から論文完成までの10ステージ．金子書房)]. Kaneko Shobo, Tokyo, Japan. Prioleau, P., Pham, T., Anderson, D., Yanagisawa, R., Taku, K., Lobel, M., & Katz, C. (2016). 3/11 and 9/11: A multifaceted investigation of a survivor exchange program. In J. Shigemura, & R. K. Chhem (Eds. ), Mental health and social issues following a nuclear accident: The case of Fukushima (pp.83-97). Springer. Taku, K. (2010). Posttraumatic growth in Japan: A path toward a better understanding of culture-constant and culture-specific aspects. In T. Weiss & R. Berger (Eds. ), Posttraumatic growth and culturally competent practice: Lessons learned from around the globe. (pp. 129-145). Hoboken, N. J: John Wiley & Sons. Taku, K., & Shimizu, K. (2013). Shinteki-gaishogo seicho handbook: Taegatai taiken wa hitono kokoroni dou sayousuruka [Japanese translation of Posttraumatic Growth Handbook. L. G. Calhoun & R. G. Tedeschi. (Eds. ), 2006, Handbook of Posttraumatic growth: Research and Practice: Mahwah, NJ. Lawrence Erlbaum Associates], Igaku Shoin, Tokyo, Japan. Taku, K. (2014). Kanashimi kara hitoga seicho surutoki: PTG (Posttraumatic Growth) [When people grow from sorrow: PTG (written in Japanese)]. Kazama Shobo, Tokyo, Japan. Taku, K. (2010). Research on posttraumatic growth: Psychological changes as a result of the stressful experiences among Japanese adolescents. Kazama Shobo. Taku, K. (2012). 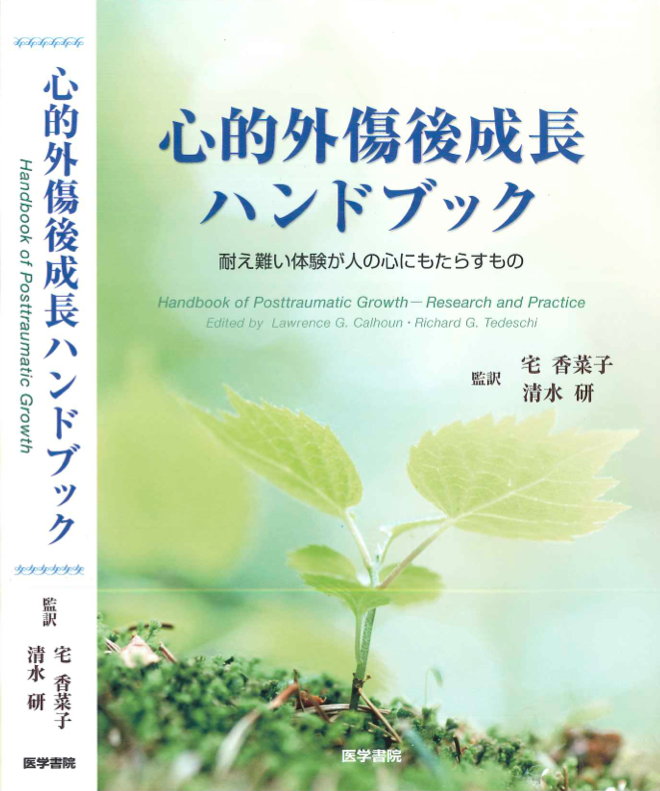 PTG research in the U.S.: From the cross-cultural perspectives (written in Japanese). In T. Kondo (Ed. ), PTG Shinteki gaishogo seicho: Beyond trauma. (pp.170-182). Kaneko Shobo, Tokyo, Japan.